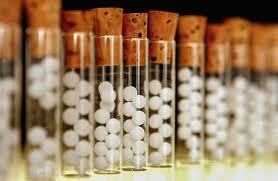 substances traditionally used in homeopathy/homotoxicology. The test system selected comprised whole-blood cultures from 12 healthy donors. 14 different, mainly plant extractions were used at potencies ranging from 1X through 14X. Incubation lasted for 24 hours. The solvent used in preparing the extracts served as control. After the incubation period the concentration of TGF-b was determined by means of a commercially available immunoassay (TGF-b ELISA, HoÈ lzel, Germany). TGF-b production was calculated as percentages of increase in comparison to the control value. Compared with the control value, all substances were found positive. The highest amounts of TGF-b where measured with potencies ranging from 2X through 8X (mean value 2.0-fold of control value). A secondary finding was that the preparations showed individual differences with regard to the TGF-b synthesis. down-regulates inflammatory leukocytes and therefore plays an essential role in controlling inflammatory processes. This immunological bystander reaction could serve as a model to explain the good effects of homeopathic/antihomotoxic remedies in the treatment of inflammatory as well as chronic inflammatory processes.